people ask, "what are you using for a microphone and audio chain?" so i decided to post some pics. 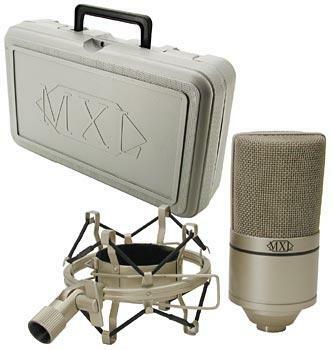 here is the new Marshall mic i just recently picked up, its the MXL 990.
my other mic is an AKG C3000, another condenser mic, very wide smooth response and very rugged (have had it for over 10 years. then it goes thru the last stage, my Alesis Nanocompressor. using it as a hard limiter. as you can see none of this stuff cost alot of money, and anything similar can help make your Class E rig sound great. what are you using on your rig? Post your pics of your audio chain here! Am going to try and modify the Turner +3, but was entertaining idea of building/buying some audio chain stuff. Thought your awsum sound was out of price range, but maybe not. More Qs will follow. I have two of the chips in my parts box, they are surface mount, you can have them if you would like. I belive that Steve QIX has a moderatly large amount of the same chip in 14pin DIP package; which are discontinued as far as I know. I was going to use this setup in my mobile, but I opted to go with the VX2000. I belive radioshack has some $20 price range dynamics. Tom N1HCI uses one and sounds pretty good. I also have two of them here, one for the FT-920 on sideband and the XLR version for the mobile/vx2000 setup. Another option is to get your hands on a Beringer vx2000 (phantom power, preamp, downward epander, compressor, parametric EQ, and de Esser) which can be had for around $120 new and one of those marshal $60 condenser mics. Oh, BTW what are you drinking these days, I owe you some beer for your help with the DC:DC converter? After hearing these Class E rigs with both the series modulators and the PDM modulators, I have determined that processing is not necessarily needed for a great sounding signal. I have heard some great audio from either no processing or simple Behringer boxes. At W1DAN, I use a MXL mic into a shure M67 (needed alot of RF bypassing) mixer. However, processing is my first love. I have designed and built a stereo 3 band compressor/limiter with input AGC. This was used on my Ranger in years past and for record mixes for the car...not much mid and high frequency boost for radio though. This box uses dbx RMS detectors (and diode peak detectors) and dbx vca's which work really well. My other current favorite box is an Optimod 9100A, then an Optimod HF 9105A for poor conditions. An effective box is the Inovonics MAP 2, which I feel is the best bang for the buck. Another box (the size of a pack of cigarettes) I have discovered is the Terk VR1 TV volume regulator. This is a 5 band digital compressor/limiter with no adjustments. Not a super high compression ratio though. $50 bucks! Oh well. One of these days I will put all this in series and ask for audio reports...from across the room! For months I ran an audio chain consisiting of an amplified D-104 with a coiled cord. I got excellent audio reports. It sounded pretty good to me, too. The D-104 did have the load resistor modification to give it a little bit of a low end. You can drive the class H modulator with an amplified D-104 just fine. I highly recommend this as a way to get going without fancy audio chains. I built Steve's one chip pre-amp, equalizer, compressor, and used it with a $3.50 electret from Radio Shack. This sounded better to me but worse to others. It convinced me I needed to do something about the fan noise (the electret was not in a holder of any kind, hence omni-directional.) I got a quiter fan. I think I'll do some more experiments with this. Now, however, I'm getting fantastic audio reports with a Heil Vintage Goldline into a Symetrix 528e. I de-vintage-ized the Heil -- removed the impedance transformer and wired the cord as balanced. Monitoriing my own signal has proven imperfect. I seem to need a lot more presence than the monitored signal seems to indicate. At one point, Mike Dorrough, K06NM, said to me, "Jon, don't be afraid to turn that high midrange knob all the way up to 11"
Hello, I just got my Alesis NanoCompressor in the mail today. It's pretty cool! I'm using it as a hard knee as the last processing stage into the PDM rig. Should elimiate alot of problems I'm having with playback of recordings. Bought an Alesis nanocompressor last night on Epay. I bought one of those Rad Shack microphone elements to play with too, but I do like the looks of that Marshall mic that Blain has. Does it come with the Lunar Escape Module, or does that cost extra? What do people use to cobble up a boom? N9NEO wrote: Bought an Alesis nanocompressor last night on Epay. I bought one of those Rad Shack microphone elements to play with too, but I do like the looks of that Marshall mic that Blain has. Does it come with the Lunar Escape Module, or does that cost extra? What do people use to cobble up a boom? I agree with Dan that processing is REALLY fun when done in such a way that avoids "ear fatigue." There is medical and scientific research documenting the syndrome, but essentially what happens is that the ears get tired when they are deprived of dynamic range. Hearing, as with vision, works on a state of change. And like when you stare at one spot too long and you lose detail, when you listen to something that does not vary in loudness you start losing one of the qualities we call "fidelity." The other system is a CRL out of Arizona, a company that bought Orban a few years ago. One unit is a four band fast acting compressor/limiter (bass, upper/lower midrange, treble), and that's followed by a peak limiter. The sound it brings is more harsh, but it is unquestionably LOUD. This pair dates to the 1980s and were intended to compete in the AM "loudness wars" that later would infect FM listening. I use them when I'm trying to toss a signal coast to coast on 75m, or when I was on 10m working international AM. Here, I happened to be using them on 40M during some nearby thunderstorms to try to get through the static. But when conditions are really good, I tend to use ONLY a gentle AVC from the 1950s, the RCA BA-6A. My brother retrieved it from a dumpster as a radio station got rid of "old stuff." It is a well-known and highly prized mic processor in the music industry. Pair of 6V6 in the output, octal tubes in the pre-amp stages. 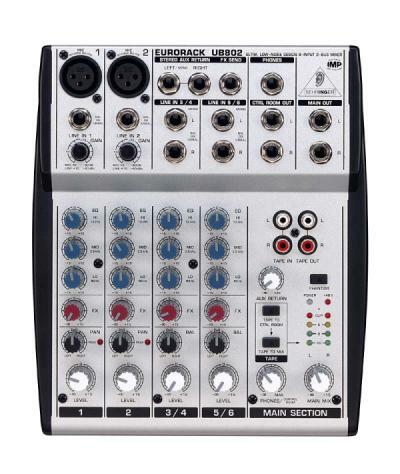 I'm looking for something along the lines of the Behringer VX2000 myself. I almost had one on ebay but it went over budget. Funny how somethings go used on ebay more than you can buy them new. Anything inexpensive along those lines would be fine as long as it's balanced audio in/out and has a phantom supply. Somebody slap me, I haven't even gotten a rig together yet and I'm already thinking of spending more..